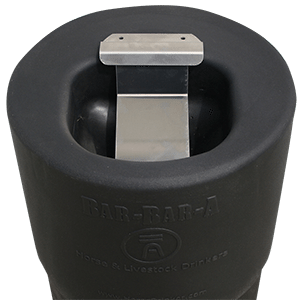 Game Animals are great recipients for using the Wild Game Water Feeder manufactured by Bar-Bar-A. Deer, elk, and bison, all can enjoy the fresh water and easy access. Fresh, clean, water is just as important for game animal’s overall good heath, as it is for other livestock. Game animals are used to drinking from streams and rivers. Moving water is a part of their natural habitat. The Bar-Bar-A bison and wild game waterer does not leave standing water to collect algae, freeze in the winter, or get hot in the summer. Because the water automatically drains away after drinking – the water is in constant motion. It is either filling or draining. While the unit is filling or draining, the moving water will let your animals drink in a fashion familiar to their environment. Game animals learn quickly to use the Bar-Bar-A. For those needing additional help the Bar-Bar-A deer water trough can be set to training mode. In this mode the unit can be temporarily made to stop drainage of the remaining water. This means water will be in the bowl when your game animals approach, for them to smell and entice them to push the paddle. After learning how to use the unit, it may be set back to draining mode. If you have been used to using electricity to heat drinking water, your animals will notice the difference. Animals are very sensitive to electrical currents and can feel a current that is unnoticeable to humans. In addition to benefiting from a non-electric deer, elek, and bison waterer you will appreciate the convenience of watering automatically rather than the manual chores previously required every day.